The size of this card is 14.8 cm x 21 cm. I used matt white and light grey paper. The white paper is embossed using the Big Shot.I glued the embossed paper to the light grey one with double side tape. For the embellishments I used dark green,red and silver paper as well as grey satin ribbon.The embellishments were cut using Spellbinder. It took a bit more than half an hour to create this card as I spent some time designing the layout. I was happy with the end result. My family is also very appreciative and supporting with my creations. 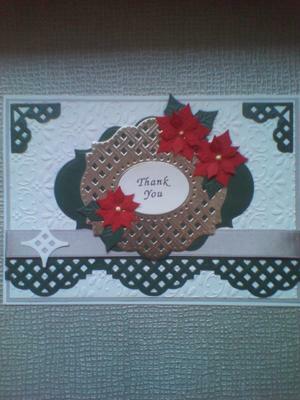 I make cards for friends and family as well as sell them. 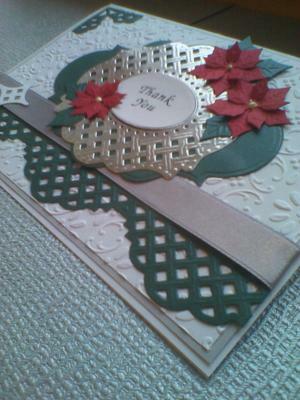 Love the use of the Lattice Spellbinders as it is such a pretty die and the border looks wonderful. It could be a very traditional Christmas card and one I am sure would take pride of place in the homes of the people that are lucky enough to get one of your creations. Love this card. It's a good basic design for any occasion.